April Is From A – Z – The A-Z Blog Challenge, That Is! Join us, Dear Reader, for a month-long celebration of letters – literally! It’s the A to Z Blogging Challenge for April, 2016! The writers of the Writer Zen Garden have collaborated to bring you posts about everything from Alphabet to Zen. Check back every day but Sunday as we explore the challenge and get some writing done. 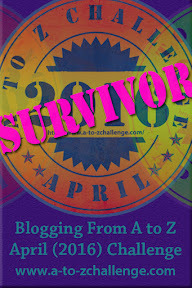 Click the picture, above, to be taken to the main Blogging From A to Z challenge page to get more information and to find out who else is participating.